Bloom With About Faces This April! Finally, the season of spring has arrived! Here comes the onset of sneezing, flowers, and pleasant weather. With perfect occasions such as World Health Day, Duke Ellington Day, or the ironically named Book-About-Faces-Today Day, get ready to party! Call 1800 923 8669 or reply to this email for more information. 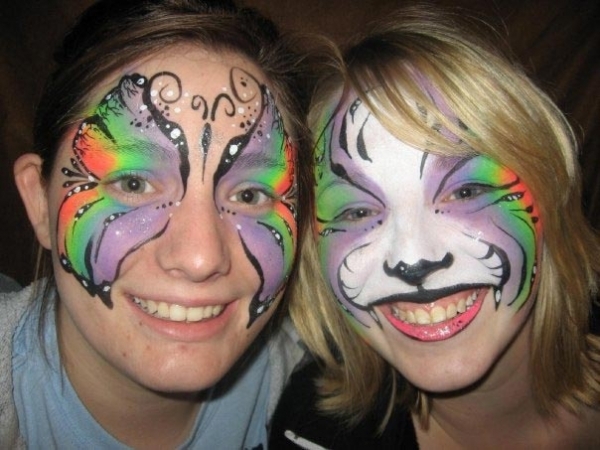 Have a face painter decorate your guests at your big Easter neighborhood bash, or a caricature artist draw you with the world in your hands for your Earth Day party! Whatever the occasion, invite the ultimate partygoer: About Faces! 6. Make everyone think twice by skipping a number in an otherwise boring and mundane seeming list (like one about April Fools pranks). And one final reminder: Don't forget that the true fool is the one who doesn't hire About Faces. April's Featured Entertainer is Michael G! Click here to reach Michael's digital caricature artist profile. I am a caricaturist, which means I exaggerate the distinctive features and personality of a person (and sometimes animal) to create a fun and humorous likeness. The area I provide my services includes the 5 boroughs of NYC, and for longer bookings the NJ and CT areas. I started off drawing caricatures at a theme park in Cincinnati Ohio in high school, over 18 years ago. 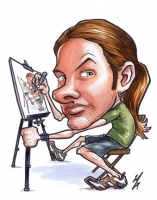 I not only drew caricatures, but also portraits and even airbrush t-shirts. It was great summer job to have between my college years at the Cincinnati Art Academy, and allowed me to work doing something I loved. Working at that park, I met my life-long best friends and the love of my life, Kelley. After a good number of years there, Kelley and I ventured out on our own, traveling around Ohio and surrounding states, drawing and airbrushing at festivals and fairs. After a successful run at the carnival life, we made the big decision to move to NYC so that Kelley could attended grad school while I started drawing for events. I've been in NYC going strong now for about 10 years. Ah, it's hard to say the most memorable, there's such a variety of experiences I've had. One fun story I can elaborate on was is for a wedding proposal. It entailed a bit of acting and secret video recording by my accomplices (Kelley, and then my brother who happened to be visiting that weekend). The client, aka guy doing the proposing, asked me to be randomly drawing on a bench along the path overlooking the New York Harbor. It's right by the Verrazano Bridge to Staten Island and makes for an iconic backdrop. He would walk buy with his lady and I would ask them if they would sit for a drawing. For the sake of time I made a more detailed drawing of the man proposing to her, based off photos of them, and had it hidden behind my pad of paper. The scene unfolded as planned, and as they sat before me his lady made friendly conversation as I started to draw them. Meanwhile the guy was nervous and sweating bullets, knowing that his big moment was coming. After a few minutes I announced, 'ready?' and pulled out the image to show them. Her eyes widened in surprise as she saw it, a huge smile crossing her face. She burst into tears as he got on one knee. She happily said yes! I love art and I love people. I enjoy the diversity of people that I meet, from a small town in Kentucky where their hometown festival is the highlight of the year, to a rich big-wig business party in a sky scraper in NY; from an Italian grandmother yelling at me to eat more of her delicious food until I pop, to a Jewish family carrying their child over their head in a chair why'll dancing around my easel. I love making the tough guy crack a big smile when I show him his picture, or getting the person intimidated by an audience to sit for me, who by the end is laughing and having a good time. I've traveled to many different states to draw and I've drawn people from around the world, and I never get tired of meeting new faces and seeing the beauty in everyone. Want to get back in contact with one of our fantastic agents? Click on their name to email them right now! Now you're done reading, pranking, and having a good first day of April: Time to set up the rest of your month to be just as awesome! Call 1800 923 8669, click on the link in my name, or reply to this email to start booking your party!